STORE Capital stock pays a dividend yielding 4.5%, has outperformed the market since its IPO, and has much growth potential. Investors can get in on legendary investor Warren Buffett's stock-picking prowess by buying shares in his holding company, Berkshire Hathaway (NYSE:BRK-A)(NYSE:BRK-B), or by buying shares of one or more of the public companies in its portfolio. Berkshire doesn't pay a dividend, so it might not appeal to income-oriented investors. Buffett, however, tends to favor dividend-paying stocks, and there are a good number of them in his portfolio. One that's a relatively new holding and may have particular appeal for some investors at this turbulent time in the market is real estate investment trust STORE Capital Corp. (NYSE:STOR). The Oracle of Omaha scooped up a 9.8% stake in STORE in mid-2017, making it the sole REIT in Berkshire's portfolio. STORE Capital focuses on stand-alone, single-tenant operational real estate (the acronym formed by the first letter of each word in that description is the inspiration for the company's name) in the United States. It was founded in 2011 by several industry veterans and went public in November 2014. Its credit rating is among the highest, relative to its peers. The company focuses on tenants that are stable and resistant to online competition. It uses long-term, net leases, with built-in annual rent increases, averaging 1.8%. The vast majority of leases in effect are triple net, which means tenants are responsible for paying property taxes, insurance, and maintenance expenses. The company's occupancy rate is consistently very high, and was 99.7% in the second quarter. STORE owned 2,084 properties across 49 U.S. states, at the end of the second quarter. By rental revenue, its portfolio was comprised of 66% service, 18% retail, and 16% manufacturing occupancies, with a total of 412 tenants operating across 105 industries. The largest tenant was Art Van Furniture, the Midwest's biggest furniture retailer, accounting for just 3.3% of the company's total annual rental income. The company targets middle-market customers, though does have some large ones, such as AMC Entertainment, a leading global operator of movie theaters. This diversity from geographic, tenant industry, and individual tenant standpoints helps protect the company from regional economic downturns, industry-specific challenges, and individual company issues. STORE focuses on tenants that are at least resistant to online competition. Service providers such as early childhood learning centers and veterinarian centers aren't going to be put out of business by online competitors. On the retail end, the company targets retailers that have an "experiential component," such as some furniture retailers. Even many folks who buy much online like to physically see, touch, and test out furniture before buying. 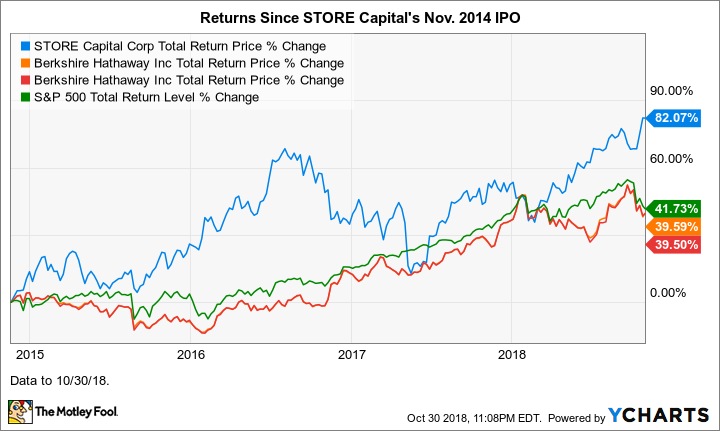 Powered by a combination of capital appreciation and a growing dividend, STORE Capital's total return has significantly outpaced the market, along with Berkshire Hathaway stock, since the company went public. Data by YCharts. STORE Capital's dividend is currently yielding 4.5%. The company's successful business model and solid management execution have resulted in adjusted funds from operations (FFO) -- akin to "earnings" for REITs -- growing at an average annual rate of 7.2% per year through 2017. In turn, that adjusted FFO growth has enabled it to increase its annual dividend by an average of 6.6% per year. STORE has been growing at a nice clip, adding about 15 net new customers and 74 new properties per quarter. The company estimates that there are more than 200 million companies in its target market, the U.S. middle market, representing a market size of more than $3 trillion. In short, STORE Capital is a Warren Buffett-approved, stable dividend-paying stock that also has solid capital appreciation potential.